Finally, after years of tracking down the right fabric and negotiating with our manufacturers, the Henderson Trousers are back. These trousers, literally years in the making, are one of our all time best sellers. The dramatic pin-striping can take a boring outfit from drab to fab in minutes. So what are you waiting for? Grab a pair and see how good they can make you look. These 100% cotton Victorian trouser feature the high waist line and suspender buttons you’ve come to love. Two side pockets and one rear pocket help stash all of your essential items and even some newfangled gadgets. 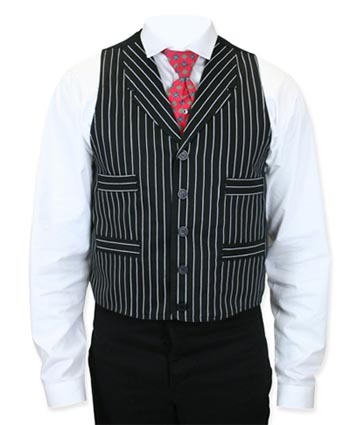 And for those wanting a matching set, try our Henderson Vest. 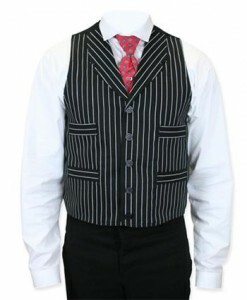 Same great 100% cotton fabric with a plain black back and adjuster buckle for a great fit. Four inset pockets adorn the front of the vest; perfect for your pocket watch or a small token of affection from your lady love. Need some style ideas on how to wear these great trousers? Take a look at this vintage photograph we uncovered. 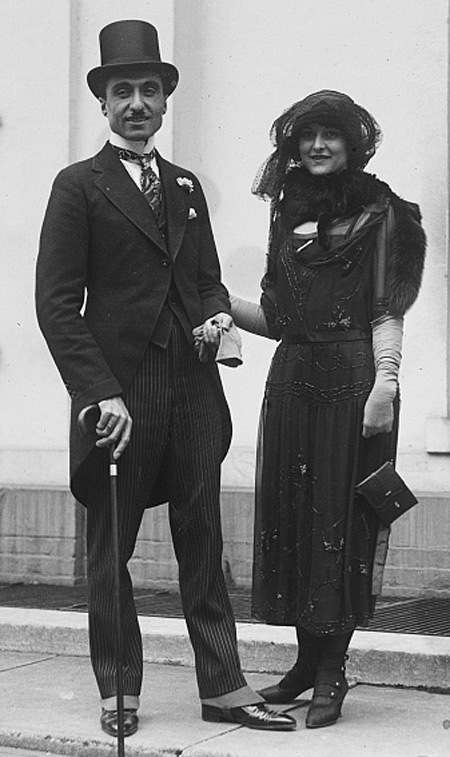 This dashing fellow combined a pinstripe trouser with a suave Cutaway Coat, Teck Tie, and Top Hat. We think he looks grand! To the right is our verson of the same look, which we updated with a black paisley ascot, Excelsior high collar shirt, and silver & claret Kingsley waistcoat.